Bruges (Brugge in Dutch), the capital and largest city of the province of West Flanders in Belgium, is located in the northwest corner of Belgium. 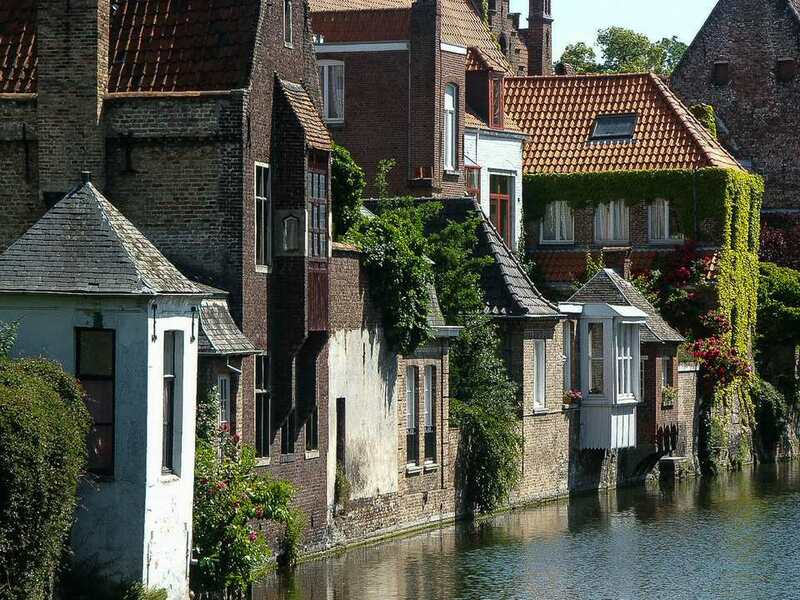 Bruges is a mere 44km from Ghent to the southeast and 145 from Brussels. The medieval center of Bruges is remarkably well preserved and is a UNESCO world heritage site. Bruges had its golden age around 1300 when it became one of the most prosperous cities of Europe. Around 1500, the Zwin channel, which provided Bruges with its access to the sea, started silting up, and Bruges began losing its economic strength to Antwerp. People began to abandon the center, which helped to preserve its medieval features. Bruges is an art city. Renowned Bruges painter Jan van Eyck (1370-1441) spent most of his life in Bruges and a statue honoring him is found in the square named after the sculptor, Jan Calloigne. Today Bruges is once again a thriving community with a population of 120,000 people, and the medieval center is one of the most beautiful in Europe. Brussels National Airport is the main airport for Bruges. The smaller Oostende airport is just 24km (15 miles) from Bruges on the coast but offers very few flights. Bruges is on the Oostende to Brussels train line (see our Belgium Map for rail lines). There are frequent trains from Brussels, Antwerp, and Ghent. It is a ten-minute walk from the train station to the historic center. For detailed instructions, see: How to Get From Brussels to Bruges or Ghent. If you have a car, don't try to drive around the narrow streets of the center. Park outside the walls (easier in early morning) or head for the main rail station and use the underground parking. If you'll be in London, you can take the Eurostar train direct to Brussels. Your ticket actually includes onward travel to any city in Belgium: free travel to Bruges! Read more about the Top Eurostar Destinations from London. During the summer season, Lamme Goedzak, a paddle steamer, will take you from the interesting little town of Damme to Bruges in about 35 minutes along the canal. You'll find plenty of parking in Damme, and you can rent bicycles there as well. The most important detail to remember is that all museums in Bruges are closed on Monday. The most popular art museum is the Groeninge Museum, covering Low Country painting from the 15th to the 20th centuries, featuring painters such as Jan van Eyck, Rogier van der Weyden, and Hieronymus Bosch. Museum times and entrance fees (don't forget to scroll down to the special offers) are found at the Groeninge Museum web page. You knew there had to be a museum of fries, so yes, there's a Frietmuseum. There are many hotels in Bruges since it is a very popular European destination. The highly rated hotels tend to sell out of rooms in the summer, so reserve early. You can also peruse our list of recommended Bruges Hotels. If you are coming into Belgium on the Eurostar, remember that on the London to Brussels route, your Eurostar ticket (buy tickets direct) is good for continuing on to any station in Belgium. One of the most popular attractions in this medieval city is a canal trip. Boats depart from the Georges Stael landing stage at Katelijnestraat 4 every 30 minutes, daily from 10h00 to 17h30. Closed from the middle of November to the middle of March. Bruges is known for chocolate, lace, and to a lesser extent diamonds. The diamond museum is at Katelijnestraat 43. You can buy a rock of your choice at Brugs Diamanthuis at Cordoeaniersstraat 5. Chocolate shops are everywhere; you can also pop into the chocolate museum Choco-Story. The municipal lace Museum is on the main canal at Dijver 16. The 12th-century basilica Heilig-Bloedbasiliek, or chapel of the Holy Blood, on Burg square contains a rock-crystal vial containing a fragment of cloth stained with what is said to be the coagulated blood of Christ. They bring it out on Fridays for veneration, but if that's not your thing the basilica is still worth a visit. On Ascension Day the relic becomes the focus of the Procession of the Holy Blood, in which 1,500 Bruges citizens, many in medieval garb, form a mile-long procession behind the relic. You probably don't think of visiting sites of early public housing on your vacation, but Bruges has a considerable number of whitewashed almshouses, many clustered around a cozy inner courtyard. They were popular ways of currying favor with God in the 14th century by wealthy townspeople or guilds and then 46 blocks of these have been preserved. Bruges is a great walking town (or you can rent bicycles and go around like natives). The cuisine is top notch (although a tad expensive), and the beer is some of the best in the world (try the Brewery De Gouden Boom at Langestraat, 47 which has a small but interesting museum). Like old-time motorcycles? You can see more than 80 motorcycles, mopeds, and scooters at the Oldtimer Motorcycle Museum in Oudenburg (Close to Ostend). Bruges hosts a popular beer festival at the start of February that runs through early March. You buy a glass and get tokens used to fill it up with your selected beers. There's also a culinary side--chefs exhibit dishes cooked with beer. This is Belgium after all. If you miss the festival--don't worry, there are plenty of bars and restaurants brewing and serving Belgian beer. A popular venue is 't Brugs Beertje at Kemelstraat 5, between the Market and the Zand, not far from the Bruggemuseum-Belfort. Opens at 4 pm through 1 am, closed Wednesday. was originally a wine tavern. Inside you'll learn about the history of Chocolate in Bruges. Workshops are held for adults and children as well. And if you're going to Choco-Late, you might as well stay on the Bruges Ice Wonderland Sculpture Festival starting in late November. And speaking of festivals, the largest religious festival in Bruges is Heilig-Bloedprocessie, the Procession of the Blood, held on Ascension Thursday, 40 days after Easter. The holy blood relic is carried through the streets and the folks following are dressed in medieval costume. Get Jazzed at the Ghent Festival!